Seniors and spiruline There are 6 products. "Spirulina is a food for all ills"
Spirulina is a high nutritional value food for the elderly because of its wealth in carotenes and antioxidant vitamins. High nutritional intensity, immune reinforcement, contributor of vitality and of tonus, participation in the good health of eyes or still in a good cardiovascular health.. Beyond 50 years, our needs and challenges in term of health become specific, like that can be the case for the growth of the body during the childhood or still the pregnancy or the feeding. At the level of the food, the nutritional concentration becomes an imperative because of a lesser absorption of nutriments by the digestive system. It is thus important to direct gradually its habits to food richer in vitamins and trace elements. The iron needs for the women decrease with the menopause, however all the other nutrients is to be supplied with bigger quantity. The proportion of deficiencies and deficit increases strongly, in particular for the vitamin A and the vitamin B12, all the Both brought in by in considerable quantities for by the Spirulina. Enfin la spiruline joue un rôle protecteur reconnu sur la bonne santé des yeux grâce à sa très haute teneur en lutéine. Les effets protecteurs de la lutéine sur la vision semblent contribuer à se prémunir de cataractes et de dégénérescence maculaire. In summary, the spiruline is clearly a high-quality food to face the challenges of the ageing. A complement of spiruline allows each to avoid these deficiencies. 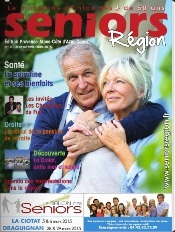 In January, 2015, the magazine Senior Region proposes us a complete file on the spiruline: of numerous benefactions for seniors. ~ or find her ? Under what forms ? ~ how to consume her ? ~ are there contraindications ? ~ and side effects ?